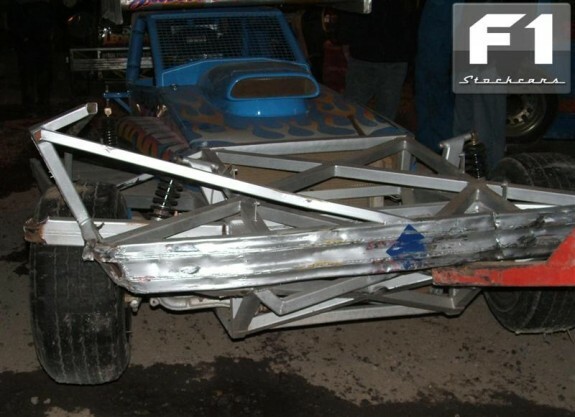 The last Saturday of September saw the first round of the new National Series ‘ShootOut’ make its debut at Skegness. On a glorious, late summers evening thirty-two cars filled the pits. This included nine of the shootout drivers as Lee Robinson (107) was missing due to suffering with engine problems. Was this a round Lee could afford to drop in the chase for the Silver roof? Having retained the World Championship, Andrew Smith was present and upon unloading it was clear to see he had opted to take the prestigious racing number 1. The format tonight was a two / thirds with each driver racing in two of three heats. Twenty-one cars on grid including six Shootout drivers whom were all graded as Superstar and starting at the rear of the grid. Shoot-out drivers: Andy Smith (#1), Tom Harris (#84), Matt Newson (#16), Stuart Smith (#390), Dan Johnson (#4) and Frankie Wainman (#515) formed up as per the driver position draw at Kings Lynn World Final with Andy Smith taking the superstar pole position. The remainder of the field consisted of two Whites, six Yellows, four Blues and three Reds. Under a clear blue and orange sky, as the Sun was sinking low the green flag started Heat One. Chris Cowley (#37) had a very early coming together with Will Yarrow (#22) that saw the the #22 car T-Boned on turns three and four, with Jim Bamford (#302) taking a knock as he passed. 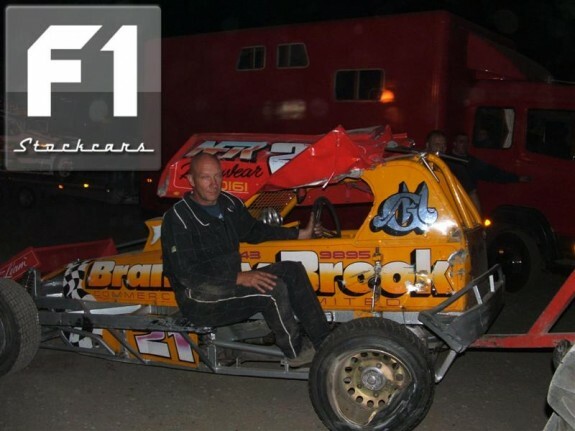 Frankie Wainman wasted no time at all in getting on the rear bumper of Andy Smith. On the following lap going into three and four he attacked and won the inside line going into turn one. Out of the Shootout cars Tom Harris got the early break and was leading them with Matt Newson and Frankie Wainman behind. Antony Davis (#327) was the early race leader, but all eyes were to the rear of the field where 390 – 515 – 4 – 1– 12 had formed a high speed train. Andy Smith attacked the rear of Dan Johnson, sending Johnson into the rear of Wainman and sending him wide round turns three and four. Wainman counter attacked going into turn one but Michael Scriven (#12) made contact with the 515 car, spinning Wainman just before the exit of turn two. Upfront Tom Harris who had now worked his way into third place unhindered by the others was settling into his groove, brushing aside back marker Will Yarrow before passing Neil Scriven (#11) on the inside to take second place. Andy Smith attacked Matt Newson, with this attack being quickly followed by Dan Johnson’s going in turn one. Newson and Johnson raced side-by-side down the back straight with Johnson getting ahead going into going turn three. Newson then attacked the rear of Johnson, getting the #4 car wide but Johnson held on. With four laps to go Tom Harris was leading with Stuart Smith jnr (390) in second. Harris passed back marker Adam Bamford (#143) putting the #143 car between himself and Stuart. Stuartm who was on a charge, hassled the rear of #143 down the home straight. Bamford, flustered from the presence of Stuart appeared to lose focus down the back straight and clattered into Jim Bamford (302) who was stationary and tight against the armco on the exit of turn four. On the last Lap, Harris was clear of any challenge unlike Antony Davis (#327) who felt the front bumper of Andy Smith moving him wide going into the last turns to take third place. The sky now black and Orange and under full flood lighting, nineteen cars made their way onto the grid for the second race of the evening; one White, six Yellows, five Blues, Daniel Wainman (212) as sole Red and then the seven Shootout competitors of Tom Harris, Dan Johnson, Mark Gilbank (#21), Paul Hines (#259), Stuart Smith, Paul Harrison (#2) and Frankie Wainman. Scott Davids (#462) got away to a very fast start and was immediately forcing his way though the yellows. Stuart Smith was not letting Tom Harris get away in the second race and spun out the #84 car on the home straight after clipping the #84’s rear inside bumper exiting turn four. Stuart with the speed dial turned to max, passed Frankie Wainman with ease going into turn three on the inside. Lee Davidson (#494) was leading the race and Scott Davids was forever closing the gap, working his way though the field. Frankie Wainman needing to make his way though the pack, picked up Paul Hines (259) down the back straight, kept tight onto his rear bumper and moving the 259 car wide going into turn one and was then onto chasing down Stuart Smith. Upfront, Davids moved Carl Pickering (#141) aside to take second place, and then comfortably took the lead from Davidson who gave Davids the inside line unchallenged around turns one and two. While that was going on, Daniel Wainman was proving a bit of an obstacle to Stuart Smith with Daniel not giving up his racing line. Stuart wasted no more time behind the #212 car, sending Daniel off towards the armco around turns three and four. Daniel rolled out into traffic exiting turn four, fired up the engine and was immediately back in the race. Half Way 462 – 195 – 141 – 327 – 22 – 390 – 515. Stuart next got onto the rear of Will Yarrow entering turn three, getting the #22 car off the racing line. Frankie Wainman kept Yarrow out wide and also made the pass. Stuart next picked up Davis 327 going into turn three, again passing on the inside with Frankie Wainman again keeping the car out wide to make the pass, hot on the heels of Stuart. Carl Pickering gave Stuart the inside line down the back straight but closed the door on Wainman who had to move the 141 car with his bumper going round three and four. With five laps to go Scott Davids was leading, with Dean Whitwell (195) in second and Stuart third. Further back Paul Harrison (2) and Mark Gilbank (21) were in constant battle with each other an as the lap boards were shown; racing side-by-side. This continued right up to the final lap where going into the last turns, Harrison attacked the rear of Gilbank moving him wide; Harrison and Gilbank exited turn four side-by-side again and drag raced to the line. No whites graders came out for final heat race. Six Yellows, four Blues, four Reds and six Shoot-Out drivers: Mark Gilbank, Andy Smith, Paul Hines, Matt Newson, Paul Harrison and Dan Johnson. Ryan Harrison (#197) using his Dad’s car (Murray Harrison #97) took the early lead, while Scott Davids and Robert Broome (#41) locked horns from the off. Rob Cowley (#73) and Liam Brown (#90) tangled, hitting the armco mid point of turns one and two. As the green flag dropped, Chris Cowley (#37) and Robert Broome hooked up exiting turn four, the #37 car riding up-and-over the front of the #41 car, both cars skidding round, freeing themselves, and getting back into to the race. Chris Cowley found himself amongst the full racing speed cars of Craig Finnikin (#55), Daniel Wainman, Andy Smith and Mat Newson who were themselves locked in fierce battle going into turn one with Cowley being fired off into the armco at the mid point of one and two. Daniel Wainman was leading this battle, with Finnikin behind and Newson and Smith side-by-side, allowing Dan Johnson to join the war. Johnson attacked Andy Smith going round three and four getting the #1 car wide. Johnson kept in tight but Andy controlled the hit and changed the line with perfection, coming out of four in front of Johnson, pulling clear and closing the door as well. This flurry of attacks had allowed the #55 and #212 car to pull just a little way clear. 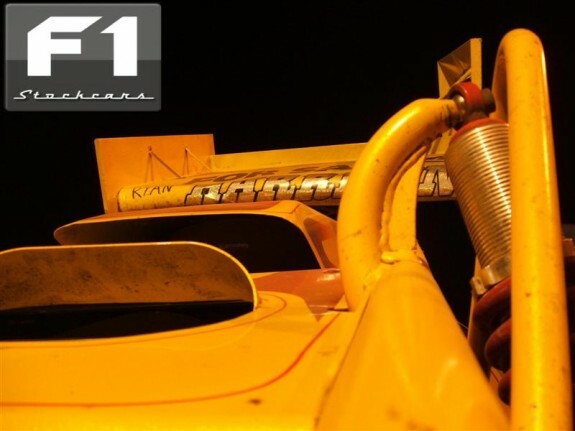 The action increased, the bumpers constantly flying in not allowing any of the ‘mid pack’ to settle, from the corner of my eye I saw Michael Scriven #12 sent out wide to the armco and then my peripheral vision picked up Newson going out wide against the armco. You just didn’t know where to look. With five Laps to go, Ryan Harrison manoeuvred his way through back markers, while Daniel Wainman’s car seems to be skidding out wide on the turns and fighting for grip. The following #1 of Andy Smith, forcing the 212 car to go faster and faster as smoke appeared from the rear tyre of the 212 car. Down to two laps to go, and second place Scott Davids was trying just too hard to catch race leader Ryan Harrison. Davids went for a lunge – from too far back to make any impact and only succeeded in giving the #197 the gap he needs to save his own tyres and to take the win. In the closing laps, Finnikin in applying the pressure to Luke Davidson (#464) got him wide and took the place. Neil Scriven (#11) tucked in behind Finnikin and kept Davidson out wide. Davidson not giving up, launched a last bend attack on #11 but with the greasy last bend Davidson skids side on and into Andy Smith as he powered down the home straight. Twenty-Five cars: Seven Yellows, five Blues, four Reds and all nine shoot-out drivers in attendance. The Green flag dropped and all Hell broke lose along the back straight from the shoot-out drivers. It appeared that all nine drivers gunned it, hoping to attack and survive going into turn three. This was not the case for Mark Gilbank who spectacularly rolled at very high speed. From where I was stood it appeared as if Frankie Wainman picked him up going down the straight with Mark appearing to connect his inside with the marker tyres, that sent his car into a roll coming to a stop on the bend where the closely following #4 of Dan Johnson had no way of stopping without making contact with the side of the #21 car. Mark exited the car unassisted. 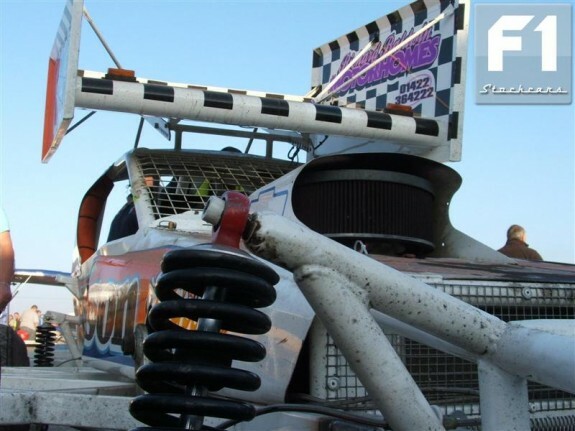 In a second incident at the same time Frankie Wainman was launched into the armco, being forced to retire from the race with front end damage. Red Flagged. Full Restart. – Minus Andy Smith (#1) and Scott Davids (#462) who also pulled off with gearbox problems to join the #21 and #515 car on the infield. Ryan Harrison (197) fired Garry Townsend (#223) into the armco on the exit of turn four as he made his way to early race leader Neil Scriven (#11) on the second lap. Ryan was attacked himself by Carl Pickering (#141) on the following lap going into turn three, Carl winning the inside and making the pass. Out of the shootout drivers, Tom Harris once again found himself the leader while behind him Stuart Smith was attacking Red grade Daniel Wainman (212), getting passed on the inside going round turns one and two. Wainman counter attacked going into turn three but was unable to move the #390 car. While in front, Tom Harris had caught the #55 car of Craig Finnikin but was stuck behind him, giving the chasing Stuart the opportunity to close ground. Harris needing to move the #55 car attacked going into turn three. Harris also drifted wide from this attack, Stuart Smith powered in tight as could be around the turns, taking the place and reaching turn one ahead of the #84 car. Finnikin then got back in front of Harris round turns one and two. Harris never let up and re-attacked the #55 car going into turn three sending Finnikin off to the armco and Harris back on the rear bumper of Stuart – sparks flying into the night sky on the exit of turn two. Ryan Harrison passed Carl Pickering then focused on the race leader, attacking the rear and then running side-by-side, while behind Paul Harrison (2) and Paul Hines (259) were bumper to bumper and working their way ever forwards. Pickering later passed both Ryan and #11 to become the race leader. With five laps to go, Stuart Smith was in third place. With four laps to go Luke Davidson (#464) attacked the rear of Ryan Harrison going into turn three sending the #197 car wide, allowing him to pass on the inside along with Chris Cowley (#37) and Tom Harris (#84). Two laps to go and Stuart bears down the home straight on race leader Carl Pickering who moves aside, giving Stuart the inside line and the lead and race win. Going into the last turns Neil #11 launched his attack onto the rear of Paul Hines (#259) as Daniel Wainman (#212) got onto the rear of Will Yarrow (#22) which filled the night sky once again with a shower of sparks. Damage to the #515 car (#347 car used) following impact to Armco. Photo Stephen Cording. Final Winner Stuart Smith took the lap handicap with four Yellow grades behind him, then four Blues, three Reds and the other eight shootout cars. Will Yarrow (#22) launched an opening attack onto the rear of Scott Davids (#462) going into turn three, while Tom Harris (#84) and Andy Smith (#1) broke clear of the shootout pack whom went into the opening turn as one giant mass of steel and horsepower. Harris initially led the #1 car but Andy attacked the rear of #84 going into turn three which saw the #84 car touch the rear of Yarrow, with both cars being moved wide and Andy passing them on the inside. Andy attacked Scott Davids, moving him wide going into turn three and taking fourth place. Davids got on Andy’s back bumper going down the home straight, attempting a counter attack going into turn one. Andy unmoved from the attack, pulled ahead round the turns and moved clear down the back straight. Will Yarrow became involved with the ongoing battle between Paul Harrison and Matt Newson. A quick moving Stuart Smith was also on the attack, going into the rear of Newson going into turn three and coming out ahead of the #16 car with five laps to go. Luke Davidson (464) had passed Carl Pickering for second place and then Andy Smith attacked Pickering’s inside going round turn one. With three Laps to go an unsighted incident sees #141 and #464 both in the armco mid point of turns three and four. Andy Smith successfully took the win, while Craig Finnikin and Dan Johnson drag raced to the line for sixth place. A swift Stuart Smith squeezed into the top ten from his lap handicap.